Welcome to another semi-educational summer boredom buster! 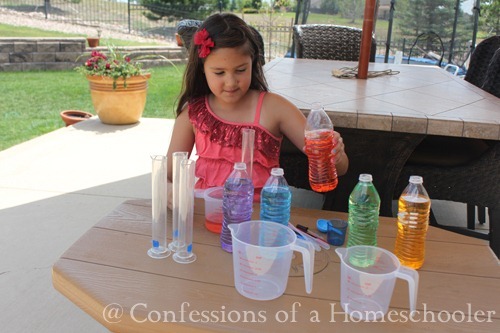 Today we’re experimenting with mystery potions and color mixing! I will start off by saying that I highly recommend you do the science lab color mixing activity O U T S I D E.
Safety glasses, you know for effect and all. I found this Liquid Measuring Kit from Lakeshore Learning, but you can really use any variety of containers you have on hand. If you’d like your children to follow some recipes, try out my color mixing cards to measure and mix new colors! Otherwise it’s also fun to let your students just mix to their little hearts content. As long as they’re outside. Directions: Mix containers with different color water. Set up the containers on a table outside, and let kids have at it. See what colors they can create, and then go grab a lemonade and that book you’ve been meaning to read! As you can see, the Teeny Tot is taking her mixing quite seriously! She played until all of the water was gone, then asked for some more. The good news is that this activity is super easy to set up, VERY cheap, and fun for the kids! 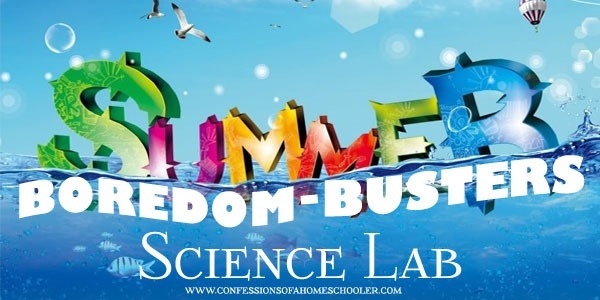 Hope you enjoy the summer science lab! What a nice website. I thought I’d pass along a few science ideas from my blog. It’s amazing how kids get so fully invested in such simple activities. 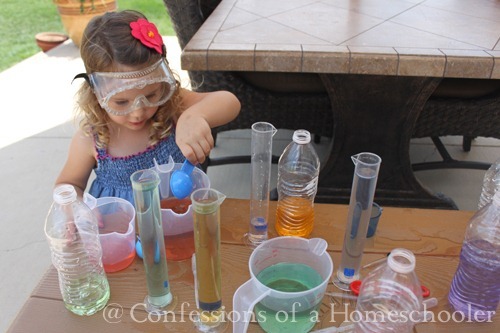 My kids love anything with water, measuring spoons, various plastic bowls, and food coloring. So fun!